Want a recipe for disaster? Take one thirty-something food columnist, living the high life as the youngest resident of a Florida retirement community in the house she inherited from her grandmother. Sprinkle with early-bird specials and nights of bingo. Add one college professor-turned-novelist, seasoned heavily with deep, dark secrets sprung from a night of drunken fun that left him changed in ways he doesn't understand. Toss in a dash of murder that rocks a quiet community. And heat until neither one can deny their growing attraction to each other. Best served hot with a side of wicked humor and a glass of Pinot Grigio. Some of you may know that I'm a pretty big Tawdra Kandle fan. Her writing always pulls me in and I never stop before the last word on the last page. This has led to some seriously late nights, but I've never regretted one moment of it. 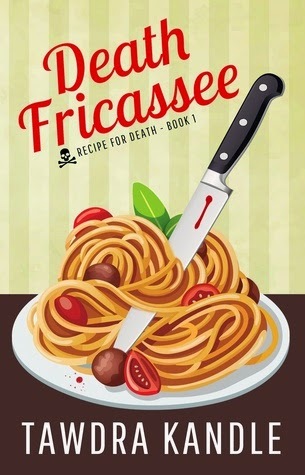 Death Fricassee is no different. It's a great blend of romance, love, loyalty and paranormal. The characters are well written and though two of them appear in a previous book, this book really can stand on its own. Also, I'm happy to say that while this book is the first in a series, it doesn't end in a cliffhanger..it ends just right, leaving you wondering the answers to some of the mystery. The rest of this series is already on my mental wish list.